Heat oven to 450°F. Place bread slices on ungreased cookie sheet. Bake 7 to 10 minutes, turning once, until toasted. Meanwhile, in food processor, place garlic. Cover; process until finely chopped. Add remaining ingredients except additional pumpkin seeds. Cover; process until smooth. Spread mixture on toasted bread slices. 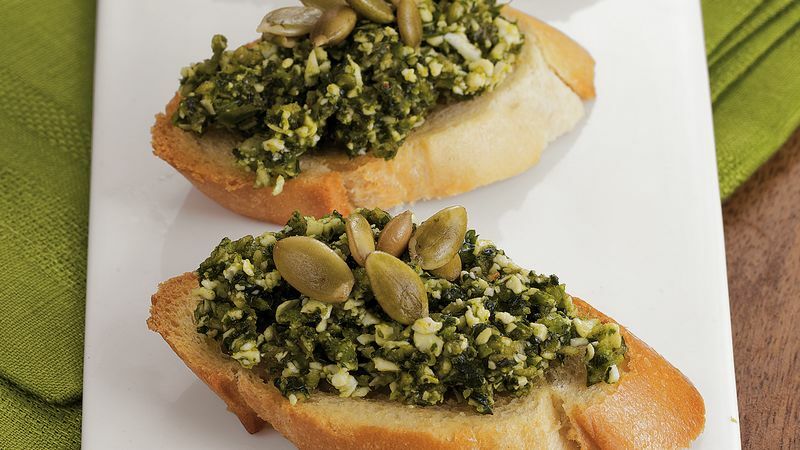 Garnish with additional pumpkin seeds. If you can't find cotija cheese, substitute freshly grated Parmesan cheese.